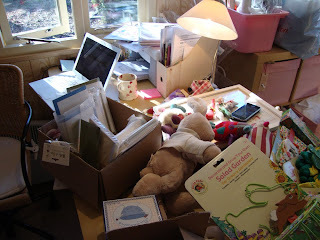 This is the horrific state of my office this morning, following several days of unpacking boxes in a hurry and pulling out stock to photograph and describe, and not tidying up as I went along. 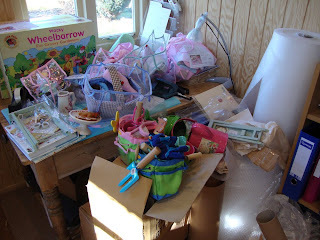 This is my packing table - lots of room for packing, as you can see. And worst of all, this is my desk. Words fail me. 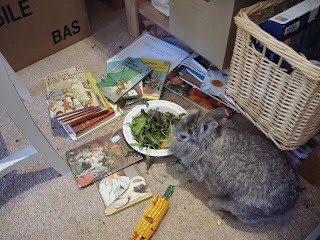 Even Humphrey's area is in a mess. This photo looks a bit staged but honestly, this is the state of the floor after a frantic search through my children's books to find a suitable backdrop picture for some photography yesterday. So, as you can see the website and all the new products are things of beauty, but my office is most definitely not. So I have bin bags, a hoover, one hour of spare time and a lot of determination - and I will be back later with the 'after' pictures. Humphrey is so lovely. He is just the right size. You'll get it all cleaned up. 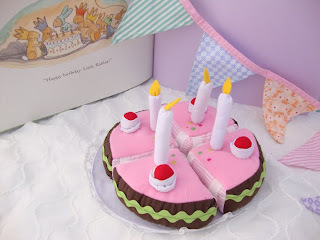 That cake and bunting are wonderful! 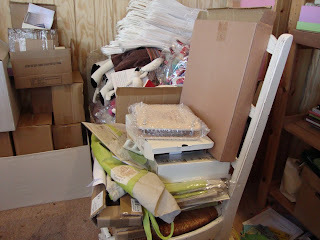 Clutter and being busy seem to go together. I find it a constant battle......good luck with achieving the lovely after!